Cetacean is a band from Los Angeles, California, that came to being in 2015 under the direction of David Sais, with members from well-established bands, such as Black Sheep Wall and Horse the Band, and other musicians. The result is a progressive blackened doom sextet and a 35-minute EP called Breach | Submerge, which was released on January 29th on CD, and will see a vinyl release on March 27th. The designation of EP for a piece longer than half an hour is quite unusual, but understandable given the lengthy nature of doom music, where slow and atmospheric riffs predominate. Let’s dive right in this pool of darkness. “Earth Is a Whisper” opens the album with a magnificent introduction akin to jazz and chamber music. Saxophone, clean guitars, smooth drums and a neat chord progression is the key to success. At almost three minutes in, distortion and screams kick in over slow chords continuing the atmosphere brought up in the intro and twisting it ever so slightly. After half the song is over, we’re thrown in a more black metal section with powerful blast beats and what sounds like a choir synth. The song ends with a clean vocals part that is reminiscent of a chorus, with effective back vocal melodies and harmonies. 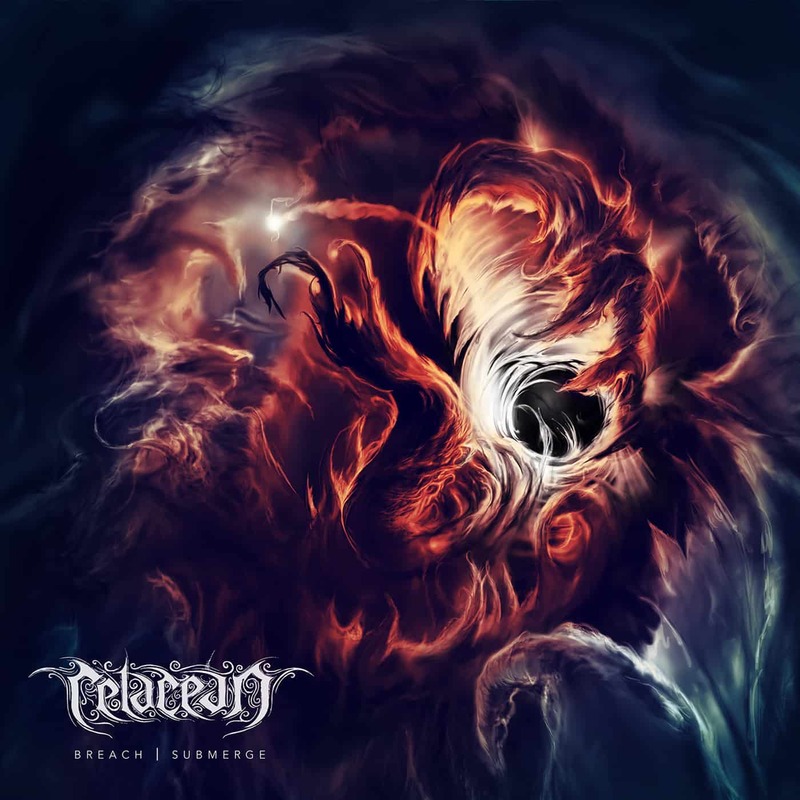 This song is very nicely built and demonstrates a lot of the variety that is to be found within the music of Cetacean. Clean sections, blast beats, slow riffs, catchy lines… all of this is pretty contradictory, but work very well when put together in a single, 10-minute song. It doesn’t feel forced or unsewn, but rather cohesive and powerful. Second in line is “Relationships Deteriorate”, another 10-minute track, but with a much more melancholic message. The first third of it is mostly clean and soft, and I really enjoy the effort that’s put into crafting lyricless vocal melodies; this can add a lot of depth to your song. The track has striking contrasts: the softer sections are sprinkled throughout the meatier most of the song. Tempo changes are more subtle here and are exploited carefully to take a firmer grasp on your heartbeats; it’s like they are in control of your subconscious body. The song gets darker and grimmer as it goes, ending with slow palm-muted ostinati accompanying yet another vocal harmony. This one is perhaps the darkest of the EP, yet doesn’t fall into the trap of over-simplifying what heavy-sounding music is. It’s still as elaborate and layered, as well as meticulously measured, as the other two. On to the last and longest track: “Outpour”. Divided in three anonymous sections, it’s only marginally lengthier, at a hair over fourteen minutes, and follows the classical form of a sonata: allegro–andante–allegro. Of course, being a doom metal composition – slow by nature -, these markings lose their tempo connotations and instead reflect the energy, the power of the movement. Thus, we get a strong, a soft, and another strong part. The two first ones are relatively quick and slow respectively, but the third one remains stately and burdened. Part II is quite interesting in its minimalistic approach; there are moving chords over a repeated motif and a few time excisions here and there that nudge you a bit, and a soulful guitar solo neat the end that build up enough momentum to introduce the last part fluidly, but they instead chose to leave a rest and bring up part III with an odd guitar introduction. That last section is more melodic than most of the album, but also feels weaker to me, especially since it’s the final movement and closure of the whole EP, and it could’ve been more memorable. Ultimately, Breach | Submerge is a good and long EP; Cetacean managed to include a variety of melodic and textural elements into a genre that’s not usually known as a harbour for them. I would have personally preferred if they left a wider place for the sax, because I only heard it in the introduction of the first song – except if they used effects on it afterwards, then I couldn’t tell -, and varied a bit more their heavier portions, but maybe I feel that way only because I’m not an intensive listener of the slower subgenres of metal. In conclusion, I greatly appreciate the lengths at which the band went in order to accommodate the diversity of influences shown in their sound, but a bit more self-examination could’ve probably gotten rid of the few less effective and forgettable parts of the album. Overall, however, it’s an enjoyable album that will most likely please fans of progressive death, doom and sludge metal; a debut album promising for the future of the band.